Your interests, needs, physical abilities, work history, education and aptitudes are considered in vocational assessment and career exploration. Through vocational testing we match you with potential training, educational, or career opportunities. Basic employment skills are evaluated through occupational therapy with assessments of upper extremity strength, cognitive and visual skills, dexterity and activities of daily living. Based on your needs your comprehensive evaluation may include residential services in a facility with accessible rooms, a dining hall and scheduled recreational activities to create a comfortable atmosphere. Trained and licensed nurses provide basic medical care for residents, diabetic education, nutritional counseling and weight management instruction. If needed, pain management sessions are available to help you learn assertiveness and relaxation skills. Special exercises and lifting techniques can reduce stress, increase strength and decrease the possibility of additional injury. Brain injury sessions are available to help you identify and address barriers to employment and develop strategies to improve your work-related performance. Based on the results of your evaluation and feedback from you and your family, we work with you to develop a plan to help overcome behavioral and cognitive limitations. Individual and group therapy sessions help you develop awareness of your limitations and provide you with an opportunity to apply and practice behavioral strategies. Depending on your needs, sessions may include adjusting to a disability, problem solving, and stress management, social support, goal setting, and memory management strategies. Rehabilitation technology can help you overcome barriers that may exist at home, school or in the workplace. Job preparedness instruction focuses on communication skills, workplace behaviors, resume development, interview preparation, and job search. These services are also available through job retention services to those who are currently employed and facing barriers to their productivity or continued employment. Thank you for believing in me. helps you achieve your physical and vocational potential through customized fitness training, physical therapy and aquatic therapy. A registered physical therapist develops, implements and supervises a therapy program for each individual. The program includes a therapeutic exercise plan designed to decrease pain and increase function. The buoyancy of water benefits consumers who have difficulty exercising in traditional ways. 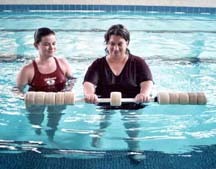 Aquatic therapy increases strength, endurance, balance and coordination. The four-week pain management comprehensive evaluation examines the relationship between tension and pain. Participants practice pain management through the use of assertiveness and relaxation skills that reduce stress while learning special exercises and lifting techniques to strengthen muscles and decrease the possibility of additional injury. The four-week brain injury comprehensive evaluation was developed in cooperation with the Head and Spinal Cord Injury (HASCI) Division of the S.C. Department of Disabilities and Special Needs, Roger C. Peace Rehabilitation Hospital in Greenville and the Brain Injury Association of South Carolina, which continue to contribute to the program. include Summer Institutes hosted by local VR offices across the state, and a Summer Camp Series hosted by VR’s Comprehensive Evaluation Centers, that feature fun-filled career and post-secondary education exploration at no cost.